Today Bibi had to chase me all around the house for a long time to get me into my travel bag, which is really for cats and small dogs. She tried tricking me with treats but it didn’t work . 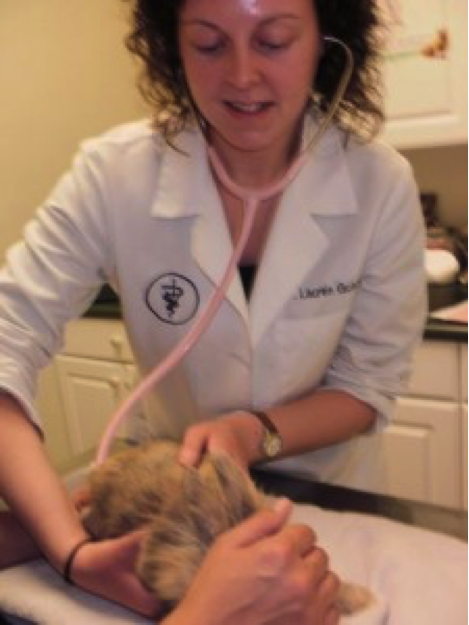 We had to go to the vet to see if everything is still OK with me since I have been here a whole year. We went to a different one this time that knows more about rabbits. They still don’t know what kind of rabbit I am, but we don’t care. I weighed 2 lbs last year but now I weigh 3 lbs. 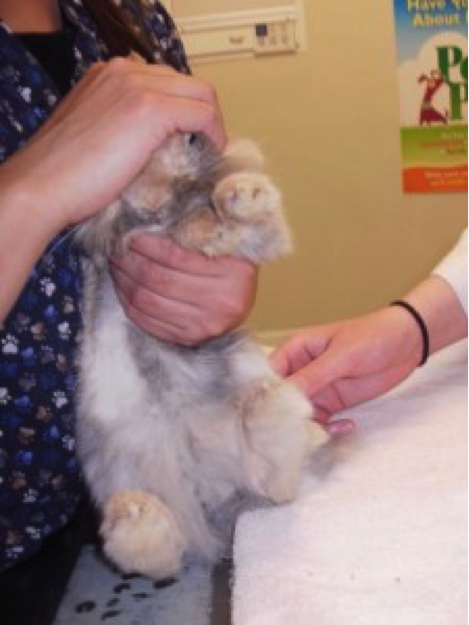 The vet said I am doing great and that I am a healthy rabbit. My teeth look good and my ears are clean. She listened to my heart too and said it sounded just right. Then I let them clip all my nails. Then we went home. I have a question for you: Do you want to know what my superpowers are? Here is a clue: I have one superpower that cats and dogs also have and I have one that they don’t have. The superpower that we both have is…. that you always always feel better when you hold us and pet us! If you pet us a lot and you will feel good a lot. The superpower that rabbits do have and cats and dogs don’t have is that we are Magic Pellet Makers. I make Magic Pellets every single day and all I need is grass and hay and vegetables to make them. My pellets make everything that grows in the ground even more happy and grow even more. Bibi puts them in the compost pile but sometimes she gets lazy and just tosses them around flowers outside the house. 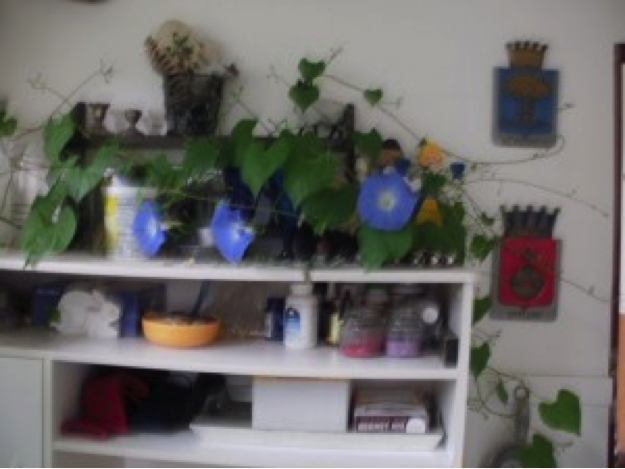 Last year she tossed some magic pellets just once by the morning glories growing outside our house. 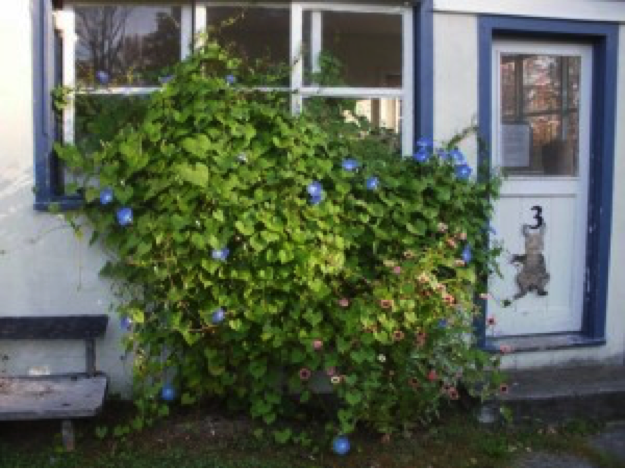 This is Bibi’s morning glories the year before I moved in. 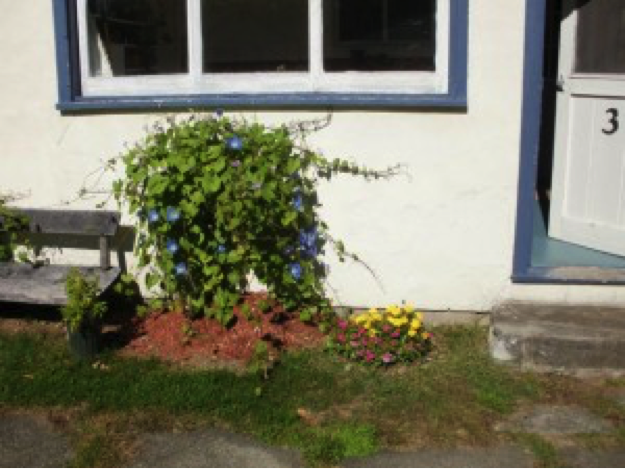 This is Bibi’s morning glories after I moved in. And they got themselves inside. They got through the tiny space in the open window on the porch! They grew too too much! 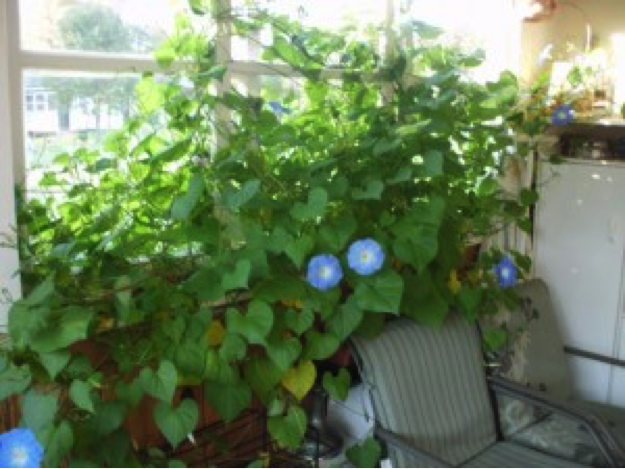 The morning glories were so crazy. They were so strong their stems were like rope, and they came in and strangled Swedish candlestick holders on her porch . You almost can’t see them but they are on top trying to just be there but the morning glories are trying to get everything. All the other years she planted them there they never once grew so big and strong like they wanted to take over the world. They looked nice but they didn’t invade the inside of the porch looking for things to strangle. It’s because we make magic pellets that can be used right away right on the plants. Then they get so big they have to take over everything! Other vegetarian animals also make good pellets because that is one of their superpowers but it has to wait a long time or the plants get burned. Something called nitrogen and phosphorous that we have better than any other animals. My pellets are ready to use as soon as I make them. 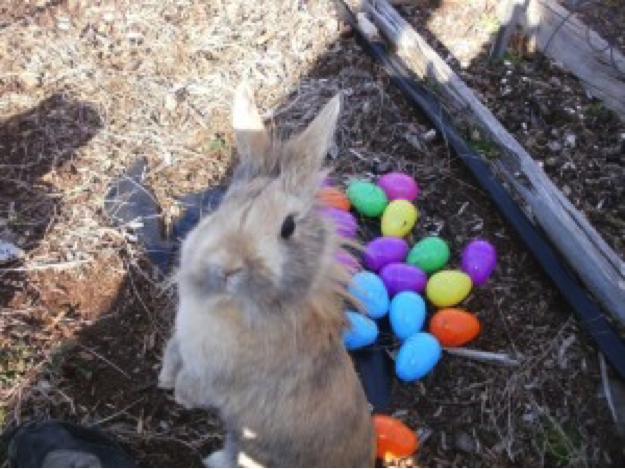 Rabbits make 200 Magic Pellets a day. This is how much I like dandelions. I eat the roots. 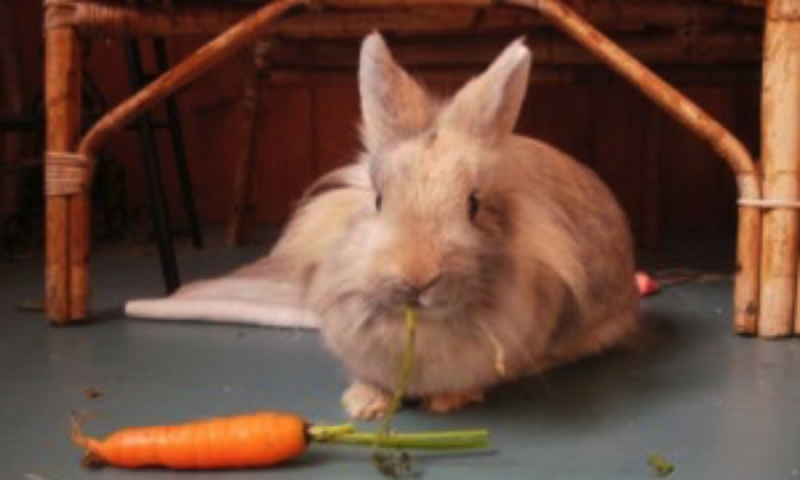 I eat the green leaves… and I eat the flowers! Now I get two fresh salads a day just with dandelions and clover and grass from outside. I want to be pet – and you feel good petting me. 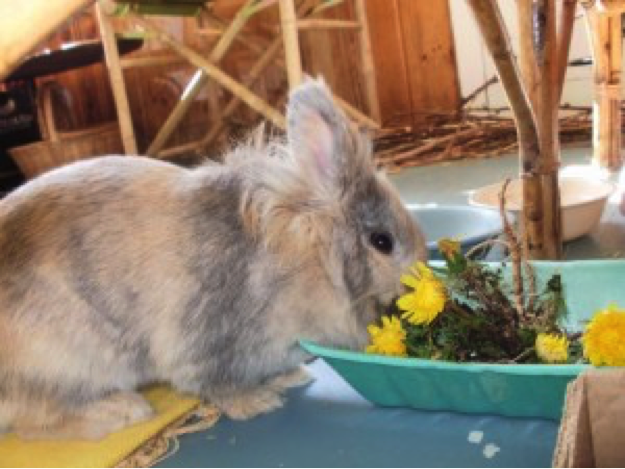 I want to eat dandelions and grass and vegetables – and I help those things grow fast and big and strong. So everything is helping me. And I am helping everything.